Tutu TOO cute is right! This adorable baby girl gift basket arrives filled with gifts for the new baby girl, keepsakes, treasures and special gifts. 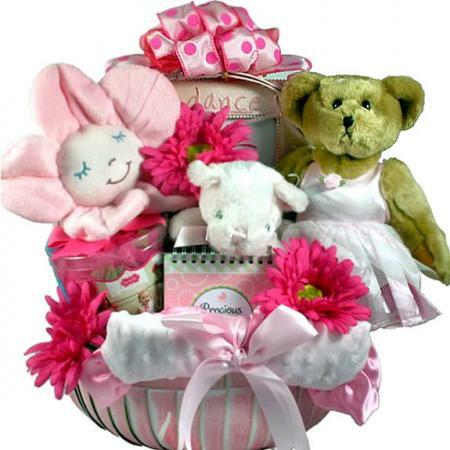 This baby girl gift basket is so adorable and how cute is this super soft ballerina bear? This is the perfect gift for their precious new baby girl. Baby girl gift basket arrives filled with gifts for the baby, keepsakes, unique treasures and special items for the proud new parents. It even includes a sweet little tutu for baby girl. They will be dancing for joy over this special gift for their budding ballerina. Click here to view more new baby gift baskets.